Home Food & WineWines & Drinks	Words of Wine Awards – Abruzzo’s European Blogger! After a day enjoying some of Abruzzo’s glorious wines at scenic boutique cantinas in the golden triangle of Loreto Aprutino, a superb evening spent amongst international wine dealers from a far as Indonesia and Novia Scotia, all savoring some of Chieti’s best seafood aboard Trabocco Pesce Palombo accompanied by Colle Moro’s wines it was onto ‘Words of Wine’. Organised by Il Consorzio di Tutela dei Vini d’Abruzzo (The Abruzzo Wine Consortium) and Centro Estero Abruzzo, (the international Chamber of Commerce), it was it was fascinating to be part of a panel discussing how Abruzzo wines could be better communicated outside the region and to visitors to Abruzzo. My two cents worth was for the region to enact a one-stop shop where the necessary information to browse, book a wine tour or special event, as well as purchase wine, would be freely available in a lingua franca. I hope this happens, Abruzzo now has amazing quality wines but it can be a job tracking them down by international wine drinkers, dealers and buyers. 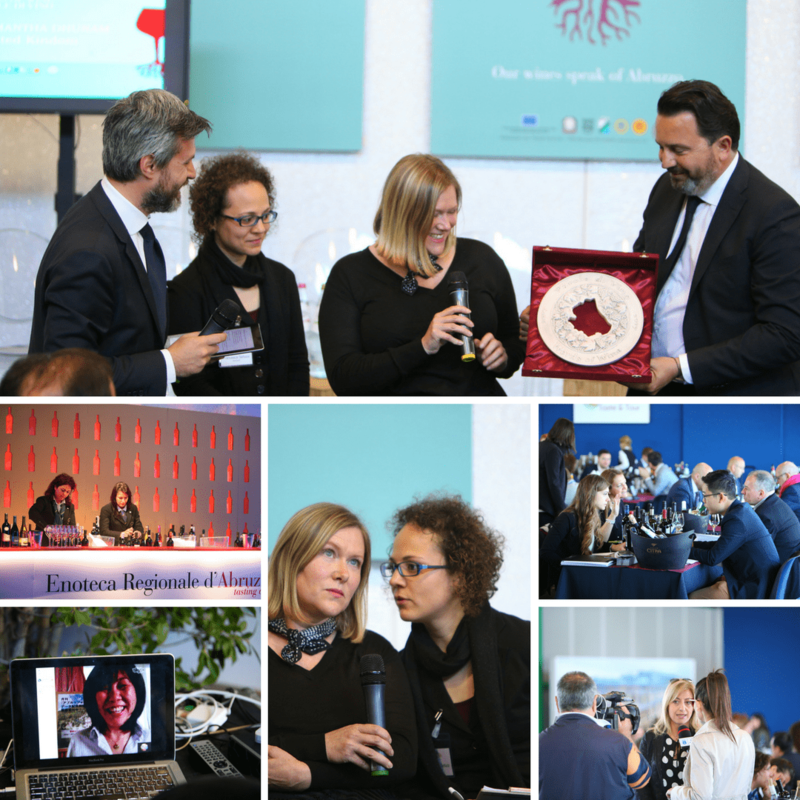 Alongside noted Italian journalists and Japanese bloggers Aya Asami (Andiamo in Abruzzo) and Yuko Hasaka, it was humbling to receive a ‘Words of Wine’ award as European Blogger. How fortunate it is to be able to write about wines that you adore! Thank you so much Zoe! My aunt and uncle bought a house there a few years ago and said it is one of the most beautiful places on earth. From all the pictures I have seen, I would have to agree. They travel back and forth and plan on retiring to thier little piece of heaven. One day we will hopefully get a chance to visit! Thanks Kev for such lovely words!